Cheesesteaks, the Liberty Bell, and the iconic steps from Sylvester Stallone’s “Rocky”—all of these can be found in the City of Brotherly Love: Philadelphia! Philly is a lot of Boston in terms of its quaint charm. The city is packed with history, good food, and tons of walkable neighborhoods. It is a quick flight or you can take the Amtrak Acela Express, which averages 17 trips a day from Boston to Philly. If you’re a big sports fan (or not! ), spending a summer day at Citizens Bank Park is a great way to enjoy nice weather and spend some time with friends. Tickets are reasonably priced, and the atmosphere is great to enjoy a cup of beer, a hot dog, and good company. In addition to getting a picture of the famous steps from the movie “Rocky”, you may also want to check out the Philadelphia Museum of Art. Current exhibits include Rachel Rose Wil-o-Wisp, Face to Face: Portraits of Artists, and Larry Fink: The Boxing Photographs, among others. One thing to note: the museum is closed on Mondays. Admission is $20/person. Manayunk is an adorable suburb about 25 minutes outside of Philadelphia that boasts plenty of restaurants, shopping, and even a brewery. Try Manayunk Brewing Company for lunch. Their indoor space is large and they have an outdoor patio as well. Beer flights are $11 and include all 9 beers on tap! My favorite was the Crunch Peanut Butter Chocolate Porter. After lunch, take a stroll around downtown and check the local shops and be sure not to miss Insomnia Cookies for dessert. To fuel up for your day of sightseeing, check out Saxby’s Coffee. 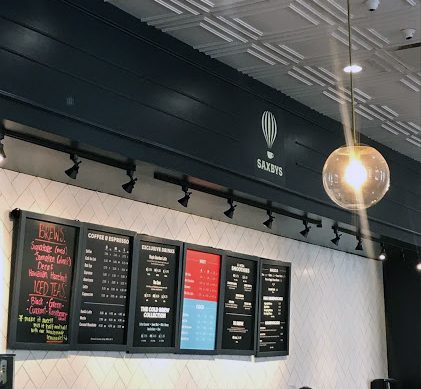 They have several locations around Philadelphia, and plenty of menu options including cold brew, smoothies, and a variety of espresso drinks. I tried the refreshing mint cold brew, recommended to me by the barista. If you’ve been to Philadelphia and haven’t tried a cheesesteak yet, this is a must-do the next time you’re in town. Located close to each other in the South Philly neighborhood, these two restaurants have a fan base comparable to the North End’s “Mike’s Pastry vs. Modern” cannoli debate. Try them both and let us know which spot you prefer! If you happen to be on a Tuesday, definitely take advantage of Distrito’s Taco Tuesday. Tacos cost $2.50-$3.00 each, the ambiance is fun and funky, and the margaritas are delicious. I recommend getting a pitcher of margs and 2-3 of their fish tacos—so good!